When “Team Kabwe” got together about six weeks before departing for Zambia, we went through a number of teambuilding activities. At one point, our team leader played us a song with a line in the chorus that says, “What else can I do, but bring a blanket for you”. The message was that sometimes you can’t do anything more than try to offer comfort. We appreciated the song, and I thought I understood the message. Arriving in Kabwe, we met the local Hands at Work staff, and received a high-level schedule. A few hours later, we met the volunteers from the first of three “CBOs" or “Community Based Organizations" that we would work with. It’s often easier to write about actions instead of emotions. So let me talk about some of the things we did with the CBOs over the following days. We helped prepare lunch to feed orphaned children their 5 - 6 meals per week. After lunches, we entertained the orphans and countless other impoverished neighbourhood children who had stopped by, hoping for leftovers. We accompanied CBO volunteers on home visits where they regularly check on their most ill and least fortunate neighbours. We tried to help where we could – sweeping yards, washing clothes, drawing and hauling water (even learning to carry it on our heads! ), and simply sharing kind words and prayer. We helped rebuild the house of a grandmother whose walls had washed away in heavy rains, and we helped one CBO plant a garden to grow vegetables for the children’s lunches. 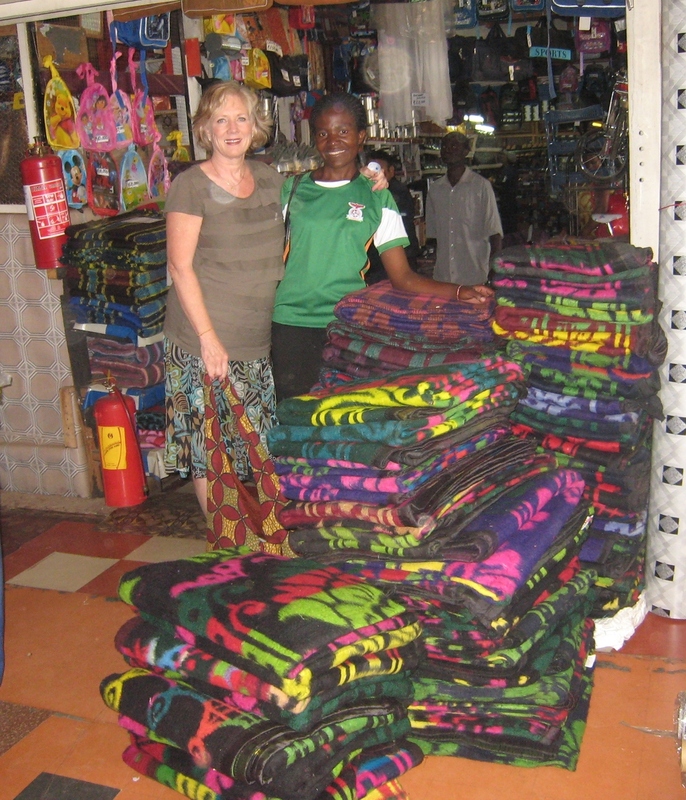 Upon our departure, we used leftover project funds to purchase blankets for the upcoming cold season (thinking that if we were getting chilly at night in our guest house, the local people must be near freezing). (Buying blankets for chilly nights)Recognizing that Hands at Work funding can only afford to cover the cost of extremely limited school supplies, we also bought some additional exercise books, pens and pencils for the children. We committed to sending final amounts from our team's fundraising to assist the Kabwe office in offering Hands at Work's three essential services: food, basic healthcare and education. That was the "what" of what we did. But it would be unfair to the people we met if I didn’t try to explain the "how". The Hands at Work model relies on supporting existing CBOs. The men and women who founded and maintain these CBOs are heroes. It takes hours to prepare and serve meals in the extremely basic kitchens of their feeding centres. It also takes hours to complete their home visits routes; in some locations it's a couple hours' walk just to reach the first house. When we were gardening, our team was covered in clay-like mud and we were wet from trying to haul water from a nearby swamp, but the end of the afternoon, the volunteers cheerfully waved us goodbye and bent back to finish up before embarking on long walks home. The people in these roles offer an immense amount of time and effort -- away from their own families and chores. And lest you think they can easily afford to do so, note that the volunteers are nearly as poverty-stricken and facing many of the same troubles as those they're trying to assist. Because it's rare for their service to be acknowledged (and yet the daily support that the orphans and others are receiving would be impossible without the volunteers) we spent time getting to know and thank them. At the end of our time in each of the three communities, we held celebratory lunches and gave them small gifts to try and acknowledge their bigger gifts. The volunteers whooped with excitement when we distributed toques, and they put leftover food in their purses to share later with their families. Some of this was hard for us to take in, but they seemed not to notice and broke into song and dance, encouraging (as always) for us to join in. Wherever we were, the volunteers and local Hands staff made us feel welcome. In the local market near the end of our stay, a few of our team members bumped into a volunteer that we'd already said farewell to a few days prior. They exchanged greetings like old friends. The volunteers and Hands staff set an example for us. It will be hard to forget Lawrence, the leader of the Hands at Work office in Kabwe who -- like his staff -- worked tirelessly. He seemed to carry more bricks than anyone as we worked on rebuilding the grandmother's house; he joined in as one of our team taught local women to knit; he did the dishes after lunches; and he always made time to encourage the volunteers. In a moment where he could have rested, we found him teaching a spelling lesson to a group of children waiting for lunch. The children themselves were extremely friendly and eager to learn -- new games, songs, stories and crafts. They were incredibly well-behaved, but we quickly learned that if we weren't careful, play-time could descend into chaos. They fell over each other trying to play with anything new…seemingly with the real concern that if they didn't get a turn that day, they might never get one. Similar to everyone else, the few non-volunteer adults we met were usually very friendly. The grandmother whose house we rebuilt greeted our volunteers with a huge amount of energy, enthusiasm and smiles all around, even as she was hungry, hunched and hardly able to walk. Our time in Kabwe was not the first time we’d encountered poverty, even for those of us who had not previously volunteered for Hands at Work. But I now know that immersing yourself in poverty is different than seeing it in passing. Giving poverty a face and a name -- giving it daily hugs -- is a different experience than simply noticing it nearby while on vacation. One of our primary roles was to offer encouragement. And that can be a challenge, as it’s hard to know what to say. But I learned that sometimes just showing up can give someone the validation to keep going. I also learned what I thought I'd already known: that while we may not be able to fix a problem, maybe we can make it easier to bear. “What else can I do, but bring a blanket for you” has a new level of meaning. Older PostWhen you look at a child, what do you see?